The song says "Let it go," but there's no way kids are going to let go of their dream of owning the Disney Frozen Snow Glow Elsa doll this Christmas!! It's poised to become one of the most asked for toys of 2014, and inevitably supplies will be limited as a result. Frozen was a hit movie - one of Disney's best ever according to most children who have seen it (and their parents too). Elsa is the main star of the show, so it makes sense that toys of her character will be a big hit. What sets this particular doll apart is the fact that she has a magical necklace that she wears in the shape of a snowflake. The necklace plays the hit song "Let It Go" from the movie. press her necklace to hear the hit song "Let It Go"
Singing and Spanish - extra features of Snow Glow Elsa! 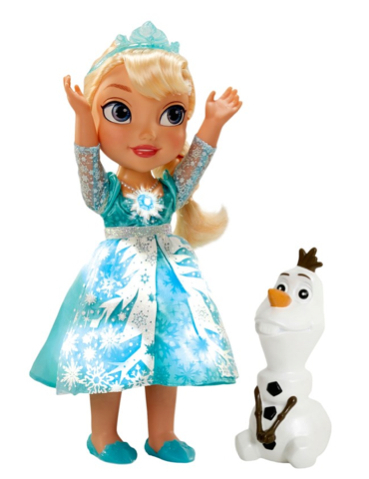 The Disney Frozen Snow Glow Elsa doll doesn't just sing the hit song. She has a bevy of phrases built in - 15 sounds and sayings for your child to enjoy. if you raise her arm up, Elsa's dress lights up as your child imagines her snow flurry being unleashed on the whole town, blanketing everything in a sea of white beauty. You can turn on the Spanish option, and let your little one learn to be bilingual by switching the language options back and forth! Parents will appreciate the "Off" button for those times when you've heard the hit song just one time too many and need a little break now and then. You do need batteries for this toy to work - three AAA batteries to be exact. While some of the Elsa dolls on the market showcase the grown version of the character, this one is for the child version of Elsa, so little girls love it even more, it seems. Consumers who have already bought this say the detail on her dress is amazing and the song is very clear, unlike many dolls where the sounds are garbled and hard to understand. If you get this doll for your little girl at Christmas, she'll probably know all of the words to the song before the day is done. If you really want to go the extra mile, you can also pick up an Anna doll so she can play with both sisters at the same time. Not only does your child get the Elsa doll, but when you purchase it, Olaf comes with it, too. Olaf is the little funny snowman from the movie who never seems to keep his carrot nose on right!